The Alpine Fault is a geological fault that runs almost the entire length of New Zealand's South Island (c. 480 km) and forms the boundary between the Pacific Plate and the Indo-Australian Plate. The Southern Alps have been uplifted on the fault over the last 12 million years in a series of earthquakes. However, most of the motion on the fault is strike-slip (side to side), with the Tasman district and West Coast moving North and Canterbury and Otago moving South. The average slip rates in the fault's central region are about 38mm a year, very fast by global standards. The last major earthquake on the Alpine Fault was in c.1717 AD, the probability of another one occurring within the next 50 years is estimated at about 30 percent. 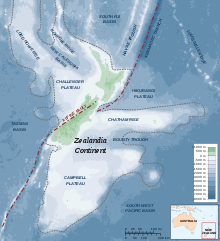 Movement along the Alpine Fault is deforming the microcontinent of Zealandia, with the southern part (on the Pacific Plate) sliding past and slightly onto the northwest part (on the Indo-Australian Plate). Snow delineates the escarpment formed by the Alpine Fault along the Southern Alps' northwest edge, near the South Island's west coast. This satellite image shows the aftermath of a blizzard that hit the island in July 2003. Map of the northern end of the Alpine Fault and Marlborough Fault System. The Pacific Plate and Indo-Australian Plate boundary forms the Macquarie Fault Zone in the Puysegur Trench off the southwestern corner of the South Island and comes onshore as the Alpine Fault just north of Milford Sound. The Alpine Fault then runs the length of the South Island just west of the Southern Alpes to near Lewis Pass in the central northern section of the island. At this point it splits into a set of smaller faults known as the Marlborough Fault System. This set of faults, which includes the Wairau Fault, the Hope Fault, the Awatere Fault, and the Clarence Fault, transfer displacement between the Alpine Fault and the Hikurangi subduction zone to the north. 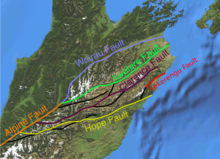 The Hope Fault is thought to represent the primary continuation of the Alpine Fault. The Indo-Australian Plate is subducting towards the east south of the South Island and the Pacific Plate is subducting towards the West to the north. In the middle the Alpine Fault is a transform boundary and has both dextral (right-lateral) strike-slip movement and uplift on the southeastern side. The uplift is due to an element of convergence between the plates, meaning that the fault has a significant high-angle reverse oblique component to its displacement. The Alpine Fault has the greatest uplift near Mt Cook in its central section. Here the relative motion between the two plates averages 37–40 mm a year. This is distributed as 36–39 mm of horizontal and 6–10 mm upwards movement on the fault's plain per year. New Zealand before the activation of the Alpine Fault (30 Ma). 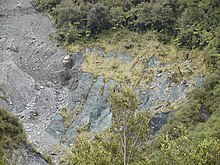 Outcrop showing hydrothermally altered cataclasite in green, within the Alpine Fault zone, Waikukupa River. Alpine Fault outcrop showing banded cataclasite and breccia, Waikukupa River. Between 25 and 12 million years ago the movement on the proto-Alpine Fault was exclusively strike-slip. The Southern Alps had not yet formed and most of New Zealand was covered in water. Then uplift slowly began as the plate motion became slightly oblique to the strike of the Alpine Fault. In the last 12 million years the Southern Alps have been uplifted approximately 20 kilometers, however, as this has occurred more rain has been trapped by the mountains leading to more erosion. This has along with Isostatic constraints has kept the Southern Alps less than 4000 m.
Uplift on the Alpine Fault has led to the exposure of deep metamorphic rocks near the fault within the Southern Alps. 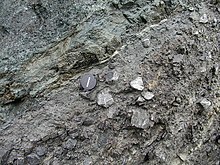 This includes mylonites and the Alpine Schist, which increases in metamorphic grade towards the fault. The eroded material has formed the Canterbury Plains. The Alpine Fault is not a single structure but often splits into pure strike-slip and dip-slip components. Also near the surface the fault can have multiple rupture zones. The fault zone is exposed at numerous locations along the West Coast and typically comprises a 10-50m wide fault gouge zone with pervasive hydrothermal alteration. Most of the movement along the fault occurs in this zone. In outcrop the fault zone is overlain by mylonites which formed at depth and have been uplifted by the fault. There have been no major historical earthquakes on the Alpine Fault. Because of this during the mid 20th century it was speculated that the Alpine Fault creeps without making large earthquakes. However, it is now inferred by multiples lines of evidence that the Alpine Fault ruptures creating major earthquakes about every few hundred years. The Māori arrived in New Zealand c.1300 but never reached a high population density in the colder South Island. So while earthquakes are an important part of Māori oral tradition, no stories have been passed down about South Island Earthquakes. Over the last thousand years, there have been four major ruptures along the Alpine Fault causing earthquakes of about magnitude 8. These had previously been determined to have occurred in approximately 1100, 1430, 1620 and 1717 CE, at intervals between 100 and 350 years. The 1717 quake appears to have involved a rupture along nearly 400 kilometres (250 mi) of the southern two-thirds of the fault. Scientists say that a similar earthquake could happen at any time as the interval since 1717 is longer than between the earlier events. Newer research carried out by the University of Otago and the Australian Nuclear Science and Technology Organisation revised the dates of the pre-1717 earthquakes to between 1535 and 1596 (instead of 1620), 1374 and 1405 (instead of 1430), and 1064 and 1120 (instead of 1100). In addition, an earlier earthquake was identified to have occurred between 887 and 965. In 2012, GNS Science researchers published an 8000-year timeline of 24 major earthquakes on the (southern end of the) fault from sediments at Hokuri Creek, near Lake McKerrow in north Fiordland. In earthquake terms, the 850 kilometres (530 mi) long fault is remarkably consistent, rupturing on average every 330 years, at intervals ranging from 140 years to 510 years. In 2017, GNS researchers revised the figures after they combined updated Hokuri site records with a thousand year record from another site 20km away at John O'Groats River to produce a record of 27 major earthquake events during the 8000-year period. This gave a mean recurrence rate of 291 years, plus or minus 23 years, down from the previously estimated rate of 329 years, plus or minus 26 years. In the new study, the interval between earthquakes ranged from 160 to 350 years and the probability of an earthquake occurring in the following 50 years was estimated at 29 per cent. Large ruptures can also trigger earthquakes on the faults continuing north from the Alpine Fault. There is paleotsunami evidence of near-simultaneous ruptures of the Alpine Fault and Wellington (and/or other major) faults to the North having occurred at least twice in the past 1,000 years. A 2018 study says that a significant rupture in the Alpine Fault could lead to roads (particularly in or to the West Coast) being blocked for months, as with the 2016 Kaikoura earthquake, with problems in supplying towns and evacuating tourists. District councils along the West Coast and in Canterbury have commissioned studies and begun preparations for an anticipated large earthquake on the Alpine Fault. Earthquake risk zones New Zealand. Until 2011 the lack of earthquakes on the Alpine Fault was interpreted as meaning lower risk. In 1940 Harold Wellman first identified that the Southern Alps was related to a fault line which ran for approximately 650 km (400 miles). The fault was officially named the Alpine Fault in 1942 as an extension of a previously mapped structure. At the same time, Harold Wellman proposed the 480 km (300 miles) lateral displacement on the Alpine Fault.This displacement was inferred by Wellman due in part to the similarity of rocks in Southland and Nelson on either side of the Alpine Fault. Lateral displacements of this magnitude could not be explained by pre-plate tectonics geology and his ideas were not initially widely accepted until 1956. Wellman also proposed in 1964 that the Alpine Fault was a Cenozoic structure, which was in conflict with the older Mesozoic age accepted at the time. This idea coupled with the displacement on the fault proposed that the earth's surface was in relatively rapid constant movement and helped to overthrow the old geosynclinal hypothesis in favour of plate tectonics. Richard Norris and Alan Cooper from the University of Otago conducted extensive research on the structure and petrology of the Alpine Fault respectively throughout the later 20th and early 21st centuries. It was during this time that the cyclicality of the Alpine Fault earthquakes and meaning of the increase in metamorphic grade towards the fault was discovered and refined. Originally this regional increase in grade was inferred to be from frictional heating along the fault not uplift of deeper geological sequences. Richard H. Sibson from the same university also used the Alpine Fault to refine his nomenclature of fault rocks which gained international adherence. The Deep Fault Drilling Project (DFDP) was an attempt in 2014 to retrieve rock and fluid samples and make geophysical measurements inside the Alpine Fault zone at depth. It was a $2.5 million international research project designed to drill 1.3 km to the fault plan in two months. The DFDP was the second project to try to drill an active fault zone and return samples after the San Andreas Fault Observatory at Depth. One of the goals of the project was to use the deformed rocks from the fault zone to determine its resistance to stress. Researchers also planned to install long term equipment for measuring pressure, temperature and seismic activity near the fault zone. It was led by New Zealand geologists Rupert Sutherland, John Townsend and Virginia Toy and involves an international team from New Zealand, Canada, France, Germany, Japan, the United Kingdom, and the United States. In 2017 they reported they had discovered beneath Whataroa, a small township on the Alpine Fault, "extreme" hydrothermal activity which "could be commercially very significant". One of the lead researchers said that it is likely to be globally unique. ^ a b c d "Alpine Fault / Major Faults in New Zealand / Earthquakes / Science Topics / Learning / Home - GNS Science". www.gns.cri.nz. Retrieved 2018-12-31. ^ a b c d e Graham 2015, pp. 120. ^ a b "New study says Alpine Fault quake interval shorter than thought: GNS Science". stuff www.stuff.co.nz. 6 March 2017. Retrieved 17 September 2018. ^ Zachariasen, J.; Berryman, K.; Langridge, R.; Prentice, C.; Rymer, M.; Stirling, M.; Villamor, P. (2006). "Timing of late Holocene surface rupture of the Wairau Fault, Marlborough, New Zealand". New Zealand Journal of Geology and Geophysics. 49: 159–174. doi:10.1080/00288306.2006.9515156. ^ a b c Graham, I. J. (2008). A Continent on the Move: New Zealand Geoscience Into the 21st Century. Geological Society of New Zealand. ISBN 9781877480003. ^ Norris, Richard J.; Cooper, Alan F. (2001-02-03). "Late Quaternary slip rates and slip partitioning on the Alpine Fault, New Zealand". Journal of Structural Geology. 23 (2–3): 507–520. doi:10.1016/S0191-8141(00)00122-X. ISSN 0191-8141. ^ Cooper, Alan F.; Norris, Richard J. (1995-02-01). "Origin of small-scale segmentation and transpressional thrusting along the Alpine fault, New Zealand". GSA Bulletin. 107 (2): 231–240. doi:10.1130/0016-7606(1995)1072.3.CO;2 (inactive 2019-03-13). ISSN 0016-7606. ^ Graham 2015, pp. 120-121. ^ McLintock, Alexander Hare; Frank Foster Evison, M. A.; Taonga, New Zealand Ministry for Culture and Heritage Te Manatu. "Earthquakes and Faults". An encyclopaedia of New Zealand, edited by A. H. McLintock, 1966. Retrieved 2019-01-05. ^ Bunce, Michael; Beavan, Nancy R.; Oskam, Charlotte L.; Jacomb, Christopher; Allentoft, Morten E.; Holdaway, Richard N. (2014-11-07). "An extremely low-density human population exterminated New Zealand moa". Nature Communications. 5: 5436. Bibcode:2014NatCo...5E5436H. doi:10.1038/ncomms6436. ISSN 2041-1723. PMID 25378020. ^ Taonga, New Zealand Ministry for Culture and Heritage Te Manatu. "1. – Historic earthquakes – Te Ara Encyclopedia of New Zealand". teara.govt.nz. Retrieved 2018-12-31. ^ "Alpine Fault". GNS Science. Retrieved 14 March 2018. ^ Booker, Jarrod (24 August 2006). "Deadly alpine quake predicted". The New Zealand Herald. Retrieved 18 January 2015. ^ Gorman, Paul (1 November 2012). "Great quakes' debris tracked". The Press. p. A5. Retrieved 18 January 2015. ^ "'Well Behaved' Alpine Fault – experts respond". Science Media Centre. 28 June 2012. Retrieved 14 March 2018. ^ Goff, J.R.; Chague-Goff, C. (2001). "Catastrophic events in New Zealand coastal environments" (PDF). Conservation Advisory Science Notes No. 333. Department of Conservation / GeoEnvironmental Consultants. ISSN 1171-9834. Retrieved September 14, 2018. ^ "Videos show devastating impact across South Island if Alpine Fault ruptures". Stuff (Fairfax). 16 May 2018. ^ "Thousands to be evacuated, highways blocked for months when Alpine Fault ruptures". Stuff (Fairfax). 26 May 2018. ^ "South Island plan for the next Alpine Fault quake". Radio New Zealand. 2018-05-15. Retrieved 2019-01-05. ^ "Emergency Response Planning". AF8 (Alpine Fault Magnitude 8). Retrieved 2019-02-06. ^ "Buller District Council Lifelines Study (Alpine Fault Earthquake Scenario)" (PDF). www.wcrc.govt.nz. 2006. ^ a b Nathan, S. (2011). "Harold Wellman and the Alpine Fault of New Zealand". Episodes. 34 (1): 51–56. ^ Wellman, H. w. (1956). "Structural outline of New Zealand (No. 121)". New Zealand Department of Scientific and Industrial Research, Wellington. 121 (4). ^ Norris, Richard J.; Cooper, Alan F. (2003-12-01). "Very high strains recorded in mylonites along the Alpine Fault, New Zealand: implications for the deep structure of plate boundary faults". Journal of Structural Geology. 25 (12): 2141–2157. doi:10.1016/S0191-8141(03)00045-2. ISSN 0191-8141. ^ Atkinson, B. K.; White, S. H.; Sibson, R. H. (1981-01-01). "Structure and distribution of fault rocks in the Alpine Fault Zone, New Zealand". Geological Society, London, Special Publications. 9 (1): 197–210. doi:10.1144/GSL.SP.1981.009.01.18. ISSN 2041-4927. ^ Townend, John (2009). "Deep Fault Drilling Project—Alpine Fault, New Zealand" (PDF). Scientific Drilling 8: 75–82. ^ a b c d e "Drilling into an active earthquake fault in New Zealand". phys.org. Retrieved 2019-02-16. ^ Ravilious, Kate (2005-12-10). "Why are scientists drilling into the San Andreas fault?". The Guardian. ISSN 0261-3077. Retrieved 2018-12-31. ^ "DEEP FAULT DRILLING PROJECT-2 FAQs / drill probe in Alpine Fault / Media Releases / News and Events / Home - GNS Science". www.gns.cri.nz. Retrieved 2018-12-31. ^ Sutherland, R.; Townend, J.; Toy, V.; Upton, P. and 62 others (1 June 2017). "Extreme hydrothermal conditions at an active plate-bounding fault". Nature. 546 (7656): 137–140. doi:10.1038/nature22355. PMID 28514440. Retrieved 14 March 2018. ^ "Geothermal discovery on West Coast". Otago Daily Times. 18 May 2017. ^ Elder, Vaughan. "Geothermal discovery on West Coast". NZ Herald. ISSN 1170-0777. Retrieved 2018-12-30. Graham, I. J. (2015). A Continent on the Move: New Zealand Geoscience Revealed. Geoscience Society of New Zealand. ISBN 9781877480478. Robinson, R. (2003). Potential earthquake triggering in a complex fault network: the northern South Island, New Zealand. Geophysical Journal International, 159(2), 734–748.